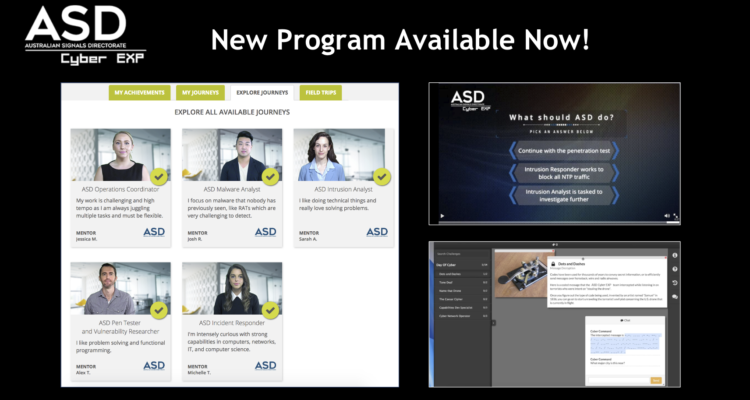 ASD Cyber EXP Program Now Available! The ASD Cyber EXP is now available for Australian students to explore the career journeys of 5 cyber security professionals working at the Australian Signals Directorate. The program aims to build awareness around career pathways in cyber security through an interactive online experience that takes students inside a simulated cyber breach on a government department where students work with the ASD team of cyber professionals to respond to the incident. According to a 2017 report by the Australian Cyber Security Growth Network, Australia will need approximately 11,000 new cyber security professionals by 2026 to adequately meet industry demand. Global demand for cyber security professionals is even greater with some estimates reaching 3.5M unfulfilled jobs in the field by 2021. A key component of Australia’s Cyber Security Strategy, released in 2016 is to “address the shortage of cyber security professionals in the workforce through targeted actions at all levels of Australia’s education system.” The ASD Cyber EXP complements ASD’s existing student outreach efforts in the Girls Programming Network, ICT Masterclass and ASD Work Experience programs. The ASD Cyber EXP is recommended for secondary and university students and is available free to all schools, teachers and students in Australia through ASD’s sponsorship. The program can be facilitated in the classroom by a teacher or completed on a student’s individual time outside of school or with a parent. The self-paced program takes approximately 60-90 minutes for each student to complete with the option for additional exploration of the program, along with recommended areas for additional study. The Australian Signals Directorate (ASD, formerly DSD) is an intelligence agency in the Australian Government Department of Defence, with its headquarters in Canberra. ASD provides signals intelligence work for the Australian Defence Force and Australian Government, in addition to providing information security advice and services to Australian federal and state government agencies. ASD also works closely with industry to develop and deploy secure cryptographic products. The program’s content includes the simulated cyber incident, exploration of five mentor profiles based on real professionals working at ASD, and a series of challenges that build skills and knowledge required for the field. The program also contains the Cyber Teacher professional learning program which empowers teachers with the foundational knowledge in cyber security needed to introduce cyber to students. The ASD Cyber EXP opportunity will be supported by a range of partnerships with leading universities offering cyber security degrees, professional teaching organisations, industry and professional bodies. The program will be facilitated by LifeJourney’s team in Australia and builds upon the success of the NSA Day of Cyber, Singtel Cyber Security Experience and the Australia Day of STEM.